It’s time once again for the club’s big summer event! (And our only event this month: there is no regular Tuesday meeting or Saturday class) Our annual Summer Potluck will take place this year at Ann Erb and John Kopp’s house. 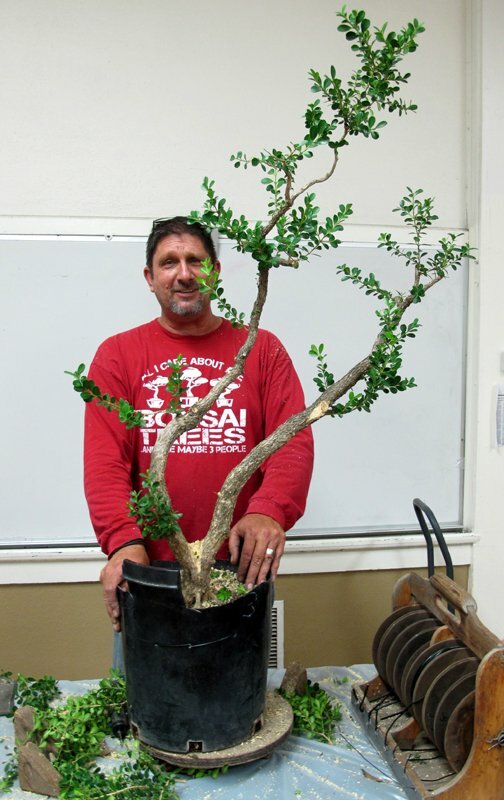 Their home is a true not-to-be-missed bonsai wonderland featuring an extensive collection of high-quality bonsai. And, as usual, it’s a real potluck, so bring a dish, any dish, to share. After lunch, stay for the raffle, and bring any bonsai-related items such as plants, pots, tools, books, etc that you would like to donate to the raffle. There are always at least a few treasures available, so bring a few dollars to take a chance on winning one or two of them. Please let Ann and John know if you plan to attend: 452-4885 or annerb@charter.net . See the accompanying map for directions. It’s time for our Summer Pot Luck at Ann Erb’s house, August 23, 735 Juniper St, Nipomo. Come and enjoy John and Ann’s bonsai and their display area. It is a “pot luck”, so bring whatever your specialty is to eat or drink, and have time for getting to know everyone. Unofficial hours are 11:00 to around 3:00. Our trip to Kimura Nursery in Northridge took place on Saturday, August 2. Our 3rd trip we planned to visit Roy Nagatoshi’s Fuji Nursery will have to be rescheduled because Roy is out of town all of September except for part of one week. I’ll let you know more on that once I can figure out an acceptable time for all. Last Month: Tom Post On Root Over Rock. Root over rock is a good style for maples. 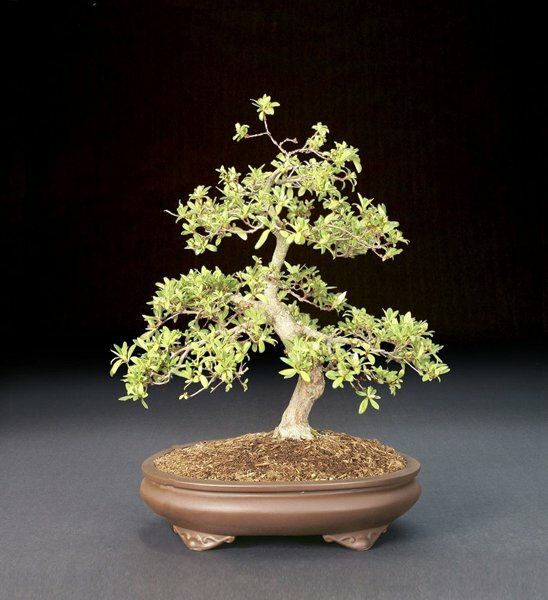 Start with a tree that is small and has many fine roots that you can distribute around an interesting rock. Tom uses young cuttings which he fixes firmly to the rock and then buries the rock and the roots in a training pot. Carefully check on the tree’s progress after the growing season and if all is well, the next growing season you can lower the soil a little bit to start to expose the roots. After a few years you should have healthy roots grasping the rock firmly. Tom says the key is patience! The process can’t he hurried. You have to wait for the tree to grow at its leisure. The picture shows of one of Tom’s maples; you can see roots that are beginning to be exposed but are still tied firmly to the rock. 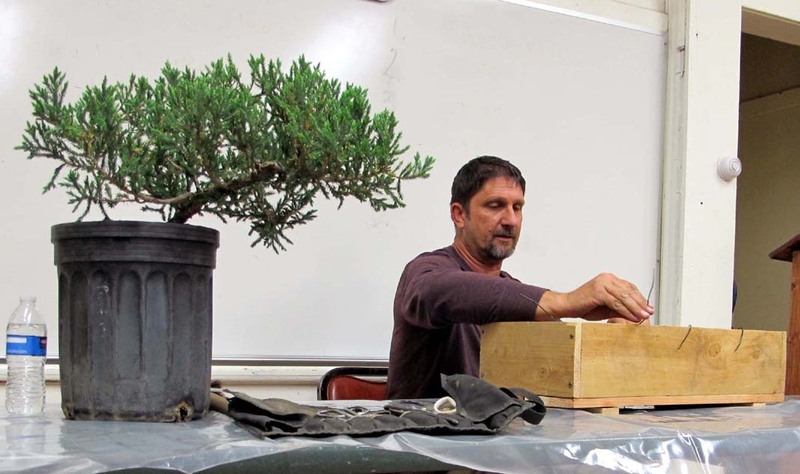 September 9: Bonsai Club Of Santa Barbara: Regular Tuesday Evening Meeting. Double Tree Hotel, 2001 Point West Way. Reservations for hotel 916-929-8855. 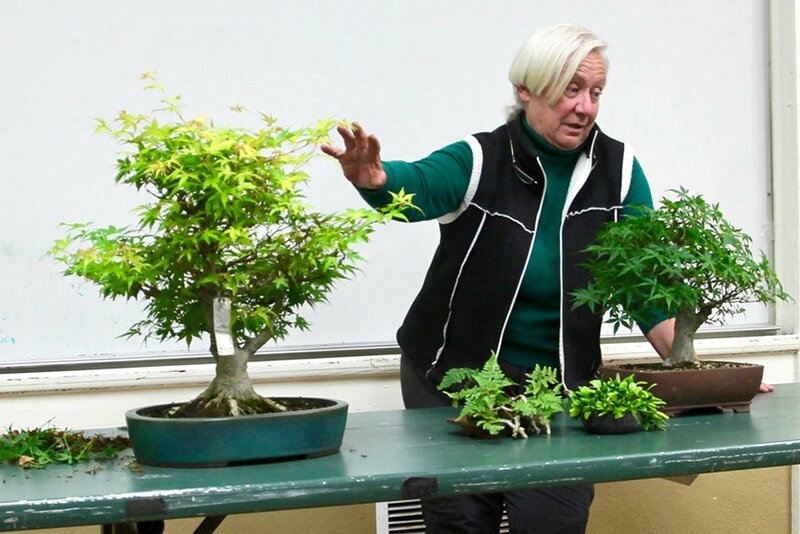 Headliners include Peter Tea, Kathy Shaner and David De Groot, ABS Learning Seminars with Ted Matson and Jack Sustic, Joshua Roth New Talent Bonsai Competition, and Special Tribute to John Naka – 100 years. Demonstrations, seminars, critiques, workshops, excursions, benefit drawings, vendors, and much more. More information and registration forms at www.gsbfconvention.org .